If I have a choice, I will almost always choose to run outside. Not only because I prefer the great outdoors to a stifling gym, but also because running on the treadmill is so boring. One day I decided to run at the gym. I don’t remember why, but I was there. 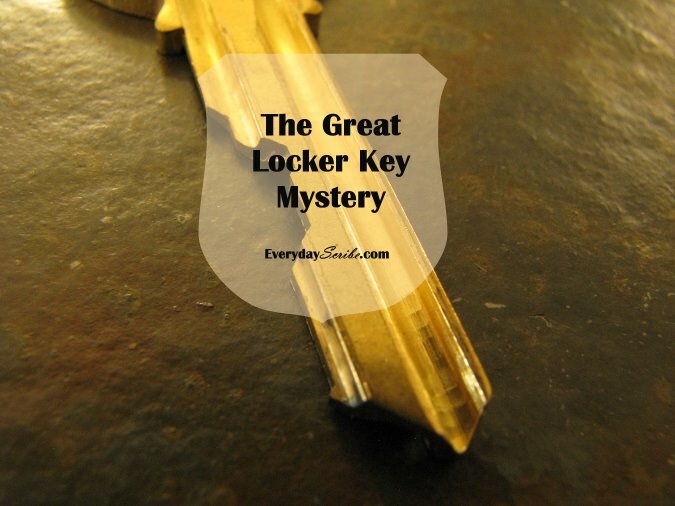 I checked in, took my things to the locker room, stored them in a locker, locked it, and took the key. I made my way to the treadmills, which I affectionately call the ‘mills. I found a mill that looked slightly less boring than the rest because it was in front of a TV and had clear view of the entrance. I love to people watch, so this mill allowed me two distractions from one convenient location. I put my locker key in the cup holder and started my warm up. After about a “lap” I increased the speed and incline. So, I’m running. Running. Running. Running. Then I hear – CLINK! I look down just in time to see the mill swallow up my locker key. In disbelief, I look in the cup holder. Yep, it was no longer there. It had found an escape through a drainage hole. Gosh darn it! I stop the mill and step off, carefully looking around to see if anyone is paying attention to my little problem. No one seems to notice, so I crouch down and look under the treadmill. Nothing. Dirt, but no key. I see no choice but to go to the front desk and ask for help. Um. My locker key fell into the treadmill I was using. I can’t find it. She acted like this was an everyday occurrence. Lots of people lose a key into the mysteries of the treadmill. She looked and didn’t see anything, so she called in reinforcements by way of two kids who looked like they were on the wrestling team in high school. Now it was getting a little embarrassing. People were definitely watching now as these two boys lift my treadmill. My key had to be someone inside the treadmill. Random thoughts like, “Oh, I hope I didn’t break it,” and “I can’t pay for a treadmill!” were running through my head. Also, “How am I going to get in the locker? My car keys are in there!” The front desk person must have read my mind because she said she could cut the lock off the locker to get my stuff out, if needed. Meanwhile, the boys were tipping the treadmill this way and that way when finally a tiny ping could be heard. There, on the floor was my locker key! It finally made its way through the mill and out the other side! Mystery solved. After a short celebration among the boys and front desk person, I took the key and headed to the locker room. I wasn’t really feeling my run anymore. Darn key, sabotaging your run like that! !